For me, the most important thing about the weekend is seeing first-hand the restorations funded by our members and all of the Museum improvements that we have funded over the years, like the better framing and protection of the masterpieces and the rearrangement of the masterpieces into rooms where they can be better understood chronologically and in the context of other artists working at the same time. This was a very valuable and inspiring part of the trip. In describing the experience of the Friends of the Uffizi, Florentine weekend, A few words come to mind immediately, “Once in a life time experience , “A cultural banquet of pure joy” and the feeling that I was part of a loving group of friends that preserve support and protect the amazing art treasures of the world. 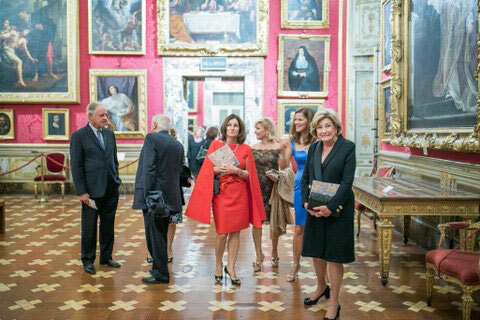 The Friends of the Uffizi give members a true feeling of inclusion and relationship. These are amazing gifts that Lisa Marie Brown and the Friends of the Uffizi offer. A night that most mere mortals will never experience. But we did! The private tour of the Uffizi Gallery given by the director, Eike Schmidt on a day when the gallery was closed to the public. This tour again was stunning informative and intimate and a once in a life time experience. I had looked forward to the Florentine weekend for over a year, however these stunning memories will stay with me for a lifetime. 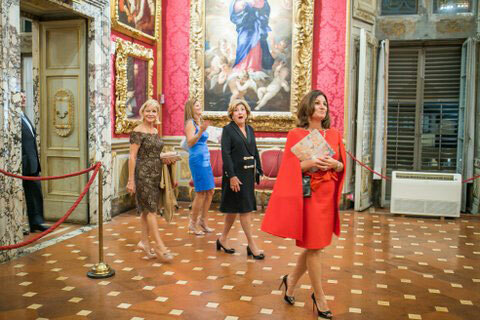 Congratulations on the success of the 2018 “Florentine Weekend.” I feel extremely honored to have had the opportunity to travel to Florence and enjoy each and every one of the special events you planned for the occasion. From the visit the Ornellaia Winery, to the dinner at the Castle della Gherardesca hosted by the lovely Contessa Sibilla, followed by the visit to the soon to be open Marino Marini Museum, the magnificent concert by the Marinisky Orchestra at the Palazzo Piti’s Sala Bianca, and the highlight, the private tour of the Uffizi Gallery, the trip was a once in a lifetime experience! Special thanks to Contessa Maria Vittoria Colonna Rimbotti for making it happen and for hosting a magnificent farewell dinner that was truly memorable. As you walk the corridors of the Uffizi think about the love and faith that inspired the artists to create such incredible masterpieces, most of which reflect divine truths. They were inspired to be sure and they were given the gifts of artistry to proclaim the life of faith in their works. See beyond the paint and marble and dwell in the very hearts of the artisans…that is how much God loves you.